Looking back at some of my older Highlander books and remembered these were the first two books I wrote for Avon. 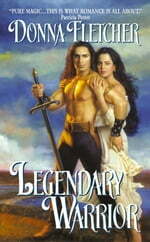 I wasn’t wild about the cover for Legendary Warrior. The heroine is petite and the hero so much taller than he’s portrayed on the cover. But I did like the cover for Dark Warrior, especially since the hero’s face isn’t visible. There’s a very good reason for that, but I can’t give away the secret if you haven’t read the book. So if you haven’t read these two and would like to give them a try, the e-book editions are only $2.99 at the following places. Last book in the Highlander Trilogy, Highlander’s Captive, coming in November!